According to data released by NASA and NOAA this week, July 2012 was the 12th and 4th warmest July (respectively) globally on record. NASA’s analysis produced the 12th warmest July in its dataset; NOAA recorded the 4th warmest July in its dataset. The two agencies have slightly different analysis techniques, which in this case resulted in not only different temperature anomaly values but rather different rankings as well. July’s global average temperatures were 0.47°C (0.85°F) above normal (1951-1980), according to NASA, as the following graphic shows. The warmest regions on Earth coincide with the locations where climate models have been projecting the most warmth to occur for years: high latitudes (especially within the Arctic Circle in July 2012). The past three months have a +0.56°C temperature anomaly. And the latest 12-month period (Aug 2011 – Jul 2012) had a +0.50°C temperature anomaly. The time series graph in the lower-right quadrant shows NASA’s 12-month running mean temperature index. The recent downturn (post-2010) is largely due to the latest La Niña event (see below for more) that recently ended. As ENSO conditions return to neutral or even El Niño-like, the temperature trace should track upward again. Figure 1. Global mean surface temperature anomaly maps and 12-month running mean time series through July 2012 from NASA. According to NOAA, July’s global average temperatures were 0.63°C (1.13°F) above the 20th century mean of 15.2°C (1.12°F). NOAA’s global temperature anomaly map for July (duplicated below) reinforces the message: high latitudes continue to warm at a faster rate than the mid- or low-latitudes. Unfortunately in July 2012, almost the entire Northern Hemisphere was warmer than normal. Figure 2. 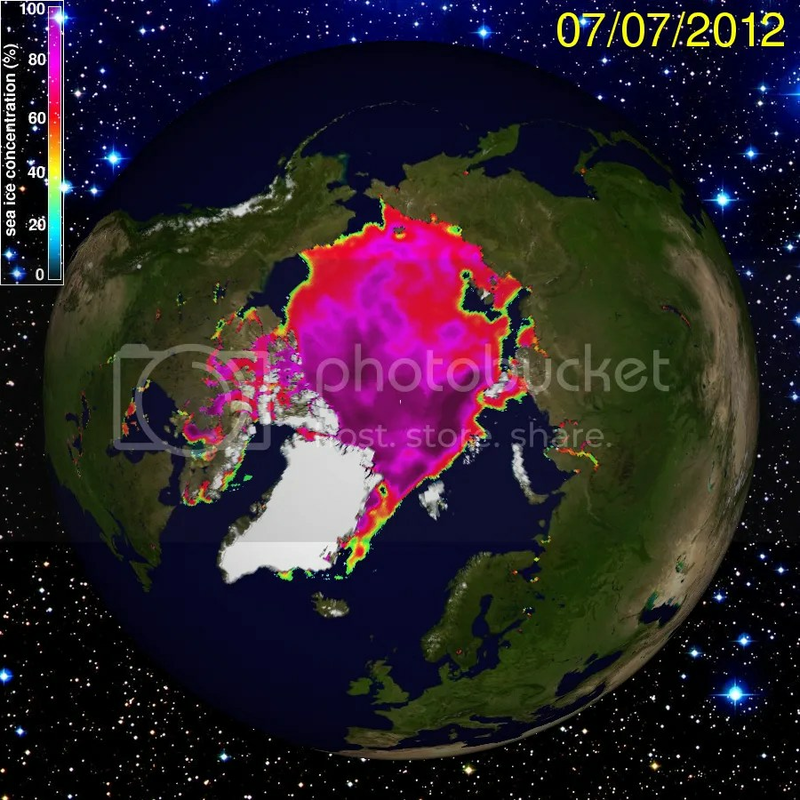 Global temperature anomaly map for July 2012 from NOAA. These figures show just how extreme (intensity & spatial extent) the heat wave over most of the US was during July 2012. As many people saw during the preceding two-and-a-half weeks, England was cooler than usual. The same was true for northwestern Europe, most of Australia, and a good portion of South America (Argentina, Bolivia, etc.) Additional anomalous warmth occurred over Greenland, Russia, eastern Europe, and into central Asia and the Middle East. The two different analyses’ importance is also shown by these figures. Despite differences in specific global temperature anomalies, both analyses picked up on the same temperature patterns and their relative strength. The continued anomalous warmth over Siberia is especially worrisome due to the vast methane reserves locked into the tundra and under the seabed near the region. Methane is a stronger greenhouse gas than carbon dioxide over short time-frames (<100y),which is the leading cause of the warmth we’re now witnessing. As I discussed in the comments in a recent post, the warming signal from methane likely hasn’t been captured yet since the yearly natural variability and the CO2-caused warming signals are much stronger. It is likely that we will not detect the methane signal for many more years. Of additional concern are the very warm conditions found over Greenland. Indeed, record warmth was observed at a 3200m altitude station in early July. 3.6°C may not sound that warm in July, but the station’s location at 10,500ft altitude is of interest. I want to post more on this later, but the early July melt occurred over a very short time period, which did not result in a great deal of runoff. In contrast, continued warmth over portions of Greenland that have not witnessed such warmth did result in rapid melting during 2012 (note: the melt season isn’t over yet either). As the second time series graph (labeled NINO3.4) shows, the last La Niña event hit its highest (most negative) magnitude more than once between November 2011 and February 2012. Since then, SSTs have slowly warmed back above a +0.5°C-1.0°C anomaly (y-axis). La Niña is a cooling event of the tropical Pacific Ocean that has time-delayed effects across the globe. It is therefore significant that the past handful of months’ global temperatures continued to rank in or near the top-5 warmest in the modern era. You can see the effect on global temperatures that the last La Niña had via this NASA time series. Both the sea surface temperature and land surface temperature time series decreased from 2009 to 2011. Note that the darker lines (running means) started to increase at the end of 2011, following the higher frequency monthly data. As the globe returns to ENSO-neutral conditions this summer and early fall, how will global temperatures respond? Remember that global temperatures typically trail ENSO conditions by 3-6 months: the recent tropical Pacific warming trend should therefore help boost global temperatures back to their most natural state (i.e., without an ENSO signal on top of it, although other important signals might also occur at any particular point in time). Looking further into the future, what will next year’s temperatures be as the next El Niño develops, as predicted by a number of methods (see figure below)? Figure 5. Set of mid-July predictions of ENSO conditions by various models (dynamical and statistical). To be considered an El Niño event, 3-month average temperature anomalies must be measured above +0.5°C for 5 consecutive months (so the earliest an El Niño event is likely to be announced is sometime this fall). Approximately 1/2 of the models are predicting a new El Niño event by the end of this year. The other models predict ENSO-neutral conditions through next spring. From the above, I hope it is clear that the US’s recent record heat wave and historic drought are associated with the most recent La Niña event. This is typical for the US, given dominant wind patterns that La Niña establishes. While El Niño would add additional anomalous warmth on top of the slowly evolving climate change signal, it usually also heralds above-average precipitation over most of the US. That would be a welcome event, given the reach and severity of the drought currently underway. Categories: global warming, NASA, NOAA, science | Tags: climate change, climate change effects, El Niño, ENSO, global temperatures, global warming, global warming effects, La Nina, NASA, NOAA | Permalink. The Scripps Institution of Oceanography measured an average of 394.49ppm CO2 concentration at their Mauna Loa, Hawai’i’s Observatory during July 2012. 394.49ppm is the highest value for July concentrations in recorded history. Last year’s 392.59ppm was the previous highest value ever recorded. This July’s reading is 1.90ppm higher than last year’s. This increase is significant. Of course, more significant is the unending trend toward higher concentrations with time, no matter the month or specific year-over-year value, as seen in the graphs below. The yearly maximum monthly value normally occurs during May. This year was no different: the 396.78ppm concentration was the highest value reported this year and in recorded history (no proxy data). If we extrapolate this year’s value out in time, it will only be 2 years until Scripps reports 400ppm average concentration for a singular month (likely May 2014). Note that I previously wrote that this wouldn’t occur until 2015. I’ve seen comments on other posts that CO2 measured at Mauna Loa should be higher than anywhere else because of its elevation and specific location. It is important to understand that this statement exists between confusing and an outright falsehood: CO2 is a well-mixed constituent of the atmosphere. While point locations might vary between each other (differences between polar and tropical CO2 concentrations vary, for example), the observations at Mauna Loa are very representative of those found across the set of observation stations. In addition, as the graphs below will help demonstrate, the historical record is very clear: concentrations have done only one thing in the past 50+ years at Mauna Loa: increased. There has been no plateauing or decrease in that time period. That being said, it is worth noting here that stations measured 400ppm CO2 concentration for the first time in the Arctic earlier this year. The Mauna Loa observations represent more well-mixed conditions while sites in the Arctic and elsewhere more accurately measure local and regional concentrations. Judging by the year-over-year increases seen per month in the past 10 years, I predict 2012 will not see an average monthly concentration below 390ppm. Last year, I predicted that 2011′s minimum would be ~388ppm. I overestimated the minimum somewhat since both September’s and October’s measured concentrations were just under 389ppm. So far into 2012, my prediction is holding up. Figure 1 – Time series of CO2 concentrations measured at Scripp’s Mauna Loa Observatory in previous Julys: from 1958 through 2012. Figure 2 – Historical CO2 concentrations from ice core proxies (blue and green curves) and direct observations made at Mauna Loa, Hawai’i (red curve). Note that this graph includes values from the past 800,000 years, 2008 observed values (~6-8ppm less than this year’s average value will be) as well as the projected concentrations for 2100 derived from a lower emissions and higher emissions scenarios used by the IPCC. If our current emissions rate continues unabated, it looks like a tripling of average pre-industrial concentrations will be our future reality (278 *3 = 834). This graph clearly demonstrates how anomalous today’s CO2 concentration values are. It further shows how significant projected emission pathways are. Note that we are on the higher emissions pathway. Given our historical emissions to date and the likelihood that they will continue to grow at an increasing rate in the next 25 years, we will pass a number of “safe” thresholds – for all intents and purposes permanently as far as concerns our species. It is time to start seriously investigating and discussing what kind of world will exist after CO2 concentrations peak at 850 and 1100ppm. I don’t believe the IPCC or any other knowledgeable body has done this to date. To remain relevant, I think institutions who want a credible seat at the climate science-policy table will have to do so moving forward. 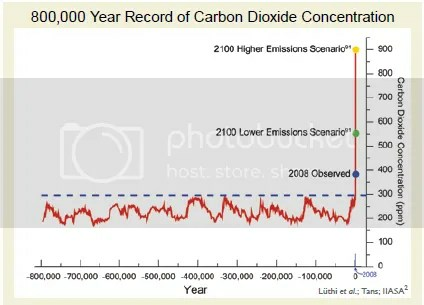 As the second and third graphs imply, efforts to pin any future concentration goal to a number like 350ppm or even 450ppm will be insanely difficult: 350ppm more so than 450ppm, obviously. Beyond an education tool, I don’t see the utility in using 350ppm – we simply will not achieve it, or anything close to it, given our history and likelihood that economic growth goals will trump any effort to address CO2 concentrations in the near future. That is not to say that we should abandon hope or efforts to do something. On the contrary, this post series is meant to inform those who are most interested in doing something. With a solid basis in the science, we are well equipped to discuss the policy options. Figure 1 – Drought conditions across the US as of 7 August 2012. Exceptional drought areas in Missouri, Arkansas, Oklahoma, Kansas, Nebraska, and Illinois grew in the past week. Some relief of drought conditions occurred in South Dakota, Wyoming, and Arizona. This drought is not expected to be significantly relieved before October. Hopefully, weather conditions in the next two months prove that prediction wrong or the effects of this drought will be further reaching and longer lasting than what people currently think. This is a good time to examine current drought-related policies and determine whether or nor they are equipped to deal with early 21st century drought conditions. If they aren’t, it seems reasonable to conclude they won’t be able to handle late 21st century drought conditions either. For example, Georgia farmers have begun irrigating crops. That practice reduces above ground streamflow, depriving aquifers the chance to recharge. Millions of people in the southeast depend on aquifer water for drinking. Which interest will win if the drought continues another 10 years? Do people get drinking water or do farmers get irrigation water? And that’s just one potential impact. The time to think and plan for this is now, before the problems grow in magnitude and complexity. Categories: drought, NOAA, policy | Tags: 2012 drought, drought impacts, policy | Permalink. The state of global polar sea ice area in early August 2012 remains significantly below climatological normal conditions (1979-2009). Arctic sea ice loss is solely responsible for this condition during this boreal summer. Arctic sea ice melted quickly in July because it was thinner than usual and winds helped push ice out of the Arctic where it could melt at lower latitudes; Antarctic sea ice has refrozen at a slightly above normal rate during the austral winter. Polar sea ice recovered from an extensive deficit of -2 million sq. km. area late last year to a +750,000 sq. km. anomaly in March 2012 before falling back to a -1.8 million sq. km. deficit. After starting the year at a deficit from normal conditions last year, sea ice area spent an unprecedented length of time near the -2 million sq. km. deficit in the modern era in 2011. Generally poor environmental conditions (warm surface temperatures and certain wind patterns) established and maintained this condition, predominantly across the Arctic last year. Conditions were slightly “better” than they were in 2007 or even in 2011 during July. As we know from past experience, that can change rather quickly as Arctic sea ice melts in August and early September on its way to its yearly minimum. Conditions are prime for another modern-day record sea ice extent minimum to occur in early September. Specific weather conditions over the next month will determine how 2012′s extent minimum ranks compared to the last 33 years. There is a very impressive low pressure system currently in the Arctic Ocean; a strong storm that normally doesn’t occur in July/August. This might seem at first to indicate that sea ice melt might not occur, but the energy being exerted on the ocean and ice is actually more likely to assist in ice melt. This is because of the turbulent motion imparted on the ocean by the storm’s winds, which repeatedly submerge ice in warmer water. The winds also bring warmer sub-surface water up to the surface. After the storm clears and within the following week, we shall see what effects the storm had on the thin Arctic ice. The concentration maps below in particular will take a few days to report the effect – they are five-day averages of measurements so that spurious data do not unduly affect ice condition assessment. Temperatures at the 925 hPa level (about 3,000 feet above the ocean surface) were typically 1 to 3 degrees Celsius (1.8 to 5.4 degrees Fahrenheit) above the 1981 to 2010 average over the Beaufort Sea and regions to the north, as well as over Baffin Bay. By contrast, temperatures were 1 to 3 degrees Celsius below average over the Norwegian Sea. In terms of longer, climatological trends, Arctic sea ice extent in July has decreased linearly by 7.1% per decade. This rate is lowest in the spring months and highest in late summer/early fall months. Note that this rate also uses 1979-2000 as the climatological normal. There is no reason to expect this rate to change significantly (more or less negative) any time soon. Additional low ice seasons will continue. Some years will see less decline than other years (like this past year) – but the multi-decadal trend is clear: significantly negative. The specific value for any given month during any given year is, of course, influenced by local and temporary weather conditions. 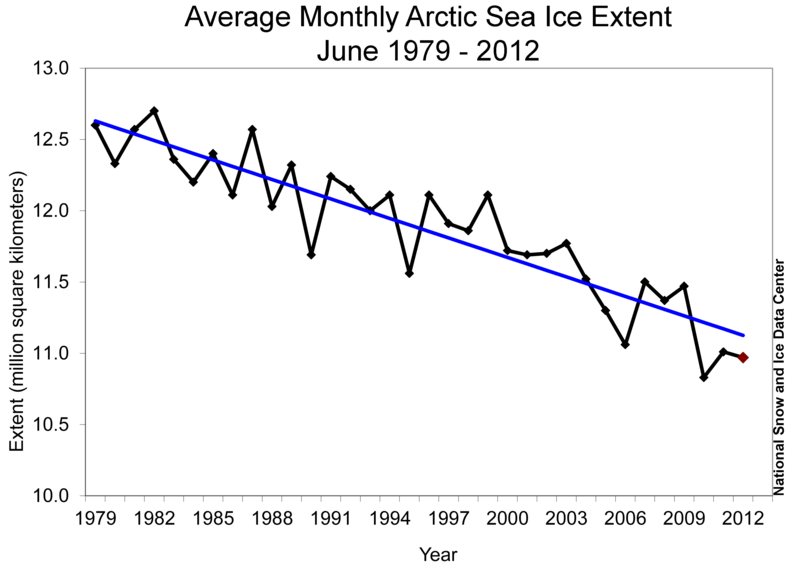 But it has become clearer every year that humans helped establish a new normal in the Arctic with respect to sea ice. This new normal will continue to have far-reaching implications on the weather in the mid-latitudes, where most people live. Figure 1 – UIUC Polar Research Group‘s Northern Hemispheric ice concentration from 20120707. 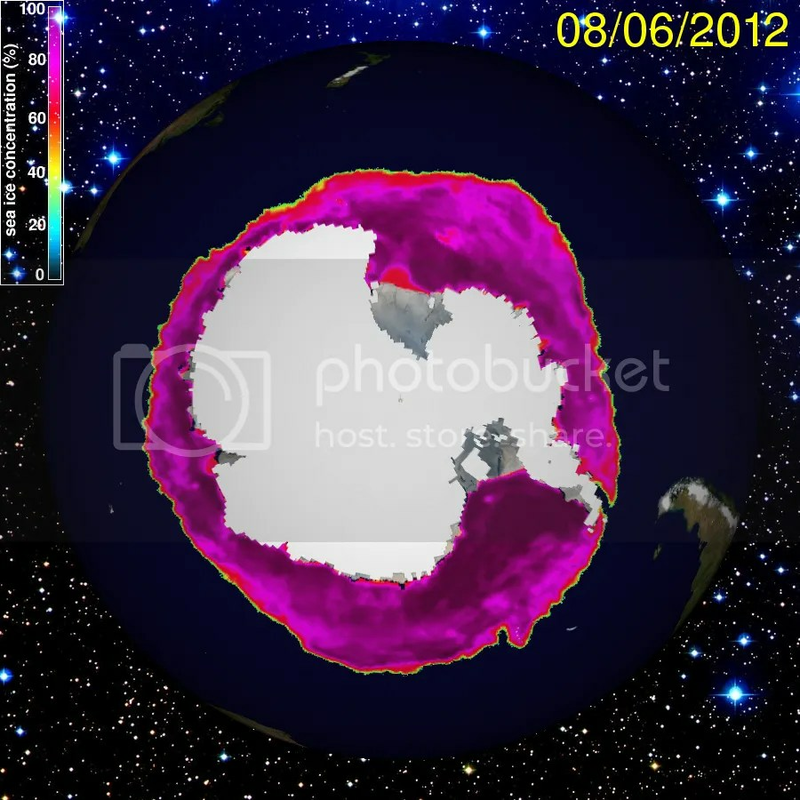 Figure 2 – UIUC Polar Research Group‘s Northern Hemispheric ice concentration from 20120806. The sea ice in the Canadian archipelago and along the northern coast of Russia determine whether the Northwest and Northeast passages open up or not. You can see by comparing the two graphs that the ice is nearly completely melted in the Canadian archipelago. The ice is also mostly melted along the entire northern coast of Russia – just a little remains in the Eastern Siberian sea. Last year, both passages opened again. I continue to think that the Northern Passage will likely open sometime this month. The Northeastern Passage might not open this year, but if it doesn’t, it won’t do so by a thin margin. You can also see in Figure 2 that the dominant wind direction has been toward Greenland. This allows ice to stack up against a landmass and not be exported as quickly out into the Atlantic Ocean where it is likelier to melt. The aforementioned Arctic Ocean storm has shifted wind direction somewhat across the basin, so I don’t expect all of the ice in Figure 2 to remain come September. Figure 3 – PIOMAS Arctic sea ice volume time series through July 2012. As the graph shows, volume hit another record minimum in June 2012. Moreover, the volume is far, far outside the 2 standard deviation envelope (lighter gray contour surrounding the darker gray contour and blue median value). Figure 3 demonstrates how anomalous conditions are for sea ice in the Arctic. The volume has exceed the -4 standard deviation this year as well as the past two years. I understand that most readers don’t have an excellent handle on statistics, but conditions between -1 and -2 standard deviations are not very common; conditions outside the -2 standard deviation threshold (see the line below the shaded area on the graph above) are incredibly rare: the chances of 3 of them occurring in 3 subsequent years under normal conditions are extraordinarily low. Hence my assessment that “normal” conditions in the Arctic are shifting from what they were in the past few centuries: a new normal is developing. Note further that after conditions returned to near the -1 standard deviation envelope in late 2011/early 2012, as it did in early 2011, volume has once again fallen rapidly outside of the -2 standard deviation area. That means that natural conditions are not the likely cause; rather, another cause is much more likely to be responsible for this behavior. 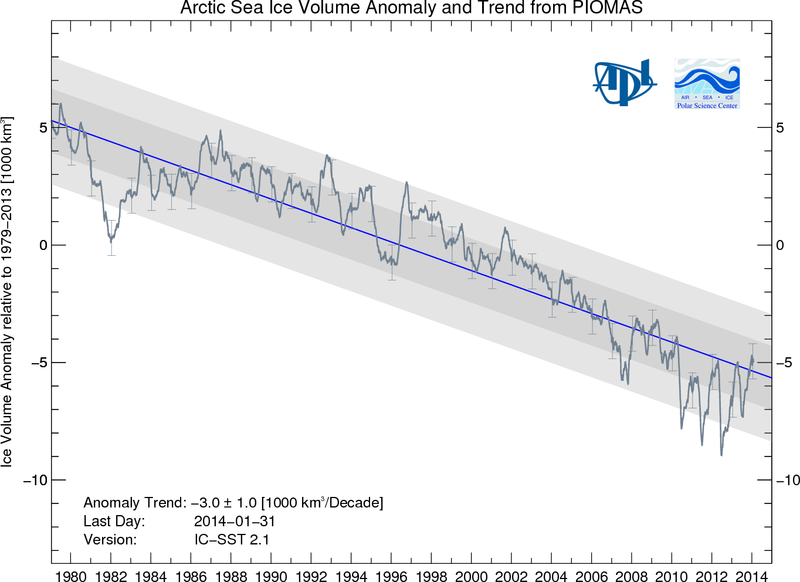 Figure 4 – PIOMAS Arctic Sea Ice Volume from 1980 through July 2012. This figure shows volume as a function of date. 2012 is the red curve, which is plotted against the average volume of 2010 through July 2012 (yellow), the average volume of the 2000s (green), the average volume of the 1990s (blue), and the average value of the 1980s (violet). Individuals years from 1979-2011 are indicated by the light gray curves. It is once again clear how anomalous recent conditions are compared to conditions from the latter part of the 20th century. It further shows how rapidly conditions have changed: the volume differences implied by this graph are astounding. The minimum volume typically occurs in early September, which we are approaching again in 2012. 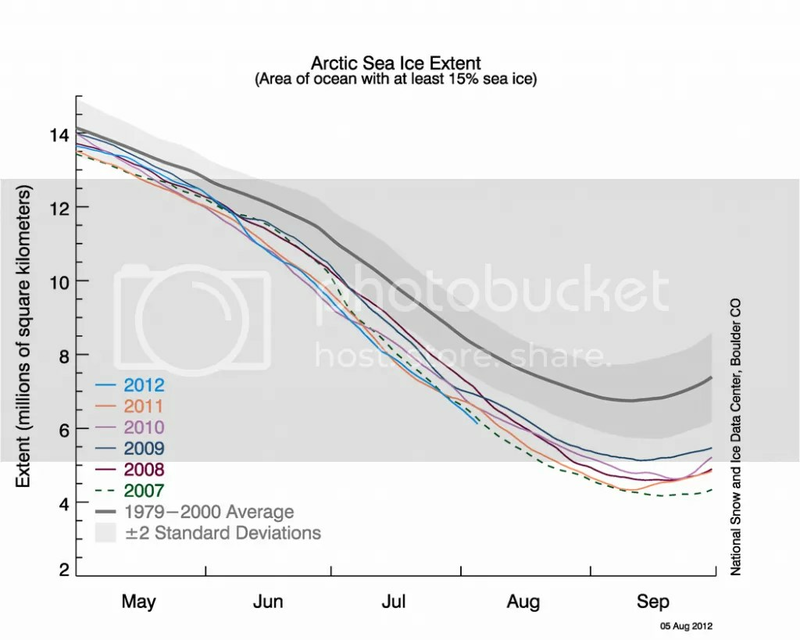 Figure 5 – NSIDC Arctic sea ice extent time series through early August 2012. This is the time series graph that the NSIDC occasionally includes in their monthly reports. I present only this graph and not the graph updated daily throughout the month because of the historical context this graph provides. The ice that piled up in the winter wasn’t thick enough to prevent rapid melt to occur (see early June 2012). The effect of the thickening over the winter on September’s minimum extent will indicate how helpful the early season winds were in building sea ice that doesn’t melt every year back up. Right now, the situation doesn’t look good for September extent. During June, as I wrote above, melting occurred at record rate, resulting in a return to record low extent conditions by the middle of June. 2012′s extent has been below 2007′s for over two months and has been challenging all-time daily record minimums for almost two months. You can also see in this time series graph that conditions since 2007 have clearly differed from the normal conditions established from 1979-2000 (light gray contours surrounding the dark gray mean value). Figure 6 – NSIDC northern hemisphere sea ice area (not extent) from the past two years only (blue) and the 1979-2008 mean (gray). The red curve shows the anomaly from the mean. 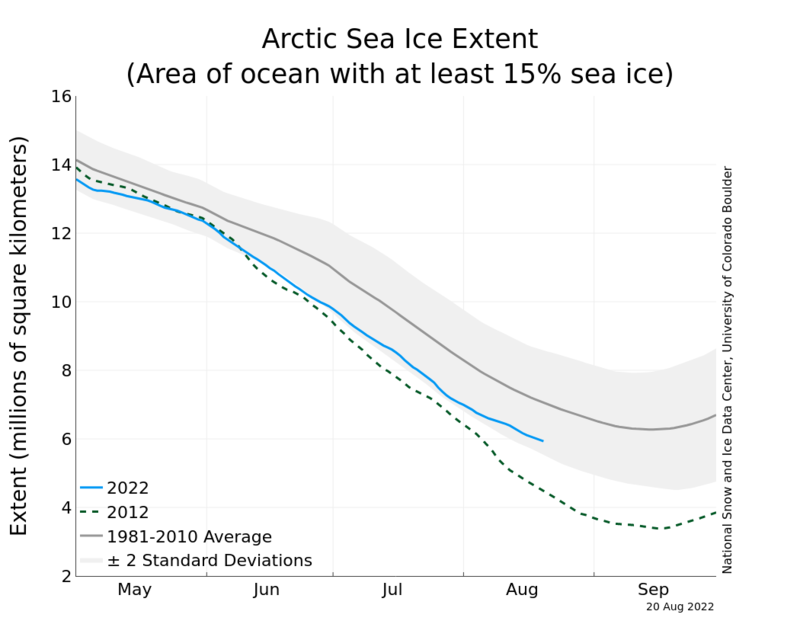 Note in Figure 6 how low the sea ice area is in the beginning of August 2012: -2.157 million sq. km.! Note two additional things. 1) The 2012 area value already is less than the climatological mean value by ~1.5 million sq. km. 2) The 2012 area value is only ~0.5 million sq. km. higher than the minimum recorded in 2011. The area value has slid just slightly under 3 million sq. km. only twice before: 2007 and 2011. Unless weather conditions change radically in the next couple of weeks, 2012 is also very likely to witness another sea ice area value under 3 million sq. km. 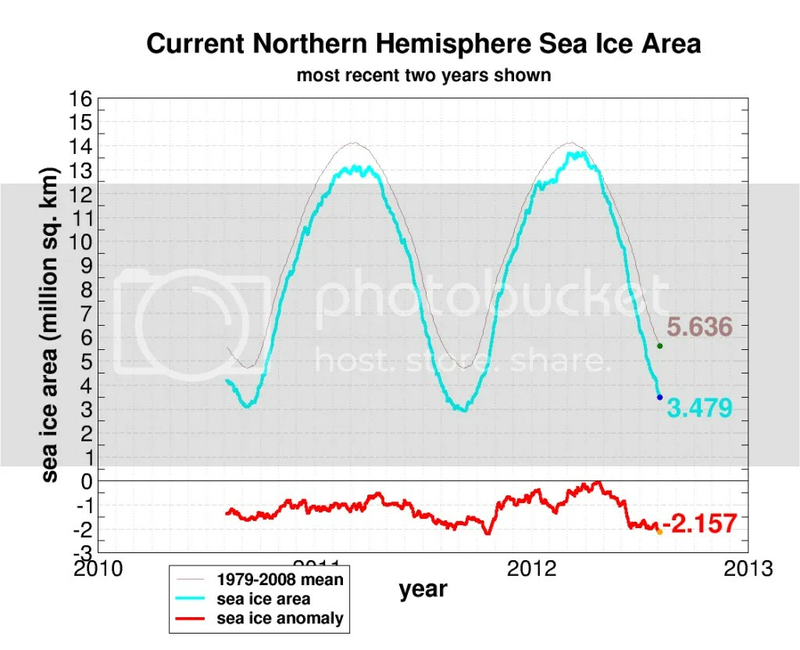 The link above also shows that sea ice area was lower than 4 million sq. km. only during the past 5 years. Back in the 1980s, the area didn’t fall beneath 5 million sq. km. except for two years (1984, 1989). This is simply another way of noting that the Arctic environment has changed substantially in the past generation. One more note about the anomaly value (-2.157 here): 2007’s lowest anomaly currently ranks as the modern-day record: -3.6 million sq. km. 2012’s anomaly value is obviously far away from that, but has spent the most time below -2 million sq. km. than any year except 2007. 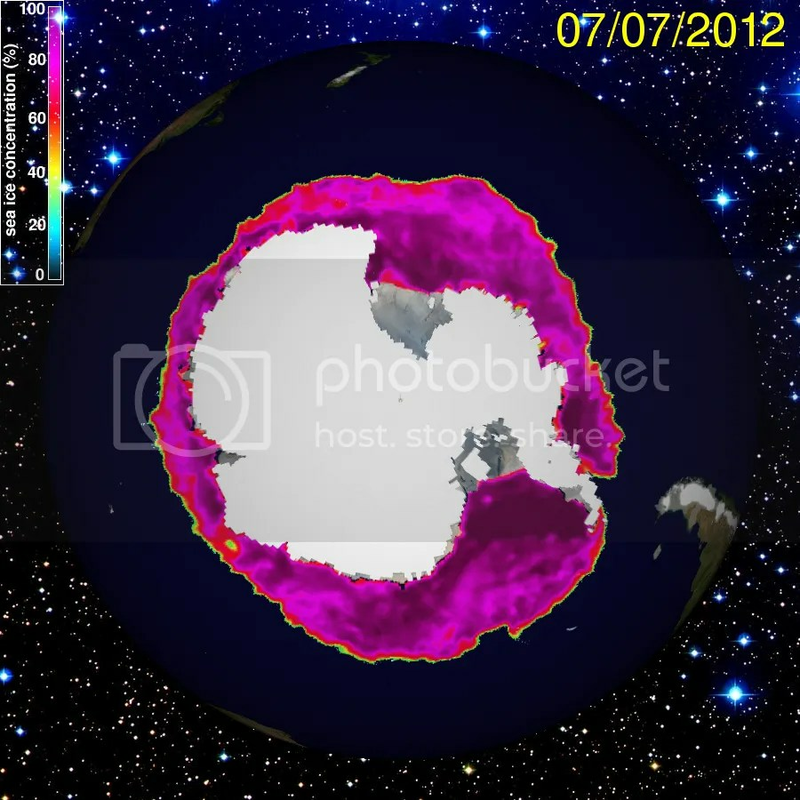 Figure 7 – UIUC Polar Research Group‘s Southern Hemispheric ice concentration from 20120707. Figure 8 – UIUC Polar Research Group‘s Southern Hemispheric ice concentration from 20120806. Ice gain is less easily visible around the continent than it was a few months ago. As a reminder, the difference between long-term Arctic ice loss and lack of Antarctic ice loss is largely and somewhat confusingly due to the ozone depletion that took place over the southern continent in the 20th century. This depletion has caused a colder southern polar stratosphere than it otherwise would be, reinforcing the polar vortex over the Antarctic Circle. That vortex has helped keep cold, stormy weather in place over Antarctica that might not otherwise would have occurred to the same extent and intensity. As the “ozone hole” continues to recover during this century, the effects of global warming will become more clear in this region, especially if ocean warming continues to melt sea-based Antarctic ice from below. For now, we should perhaps consider the lack of global warming signal due to lack of ozone as relatively fortunate. 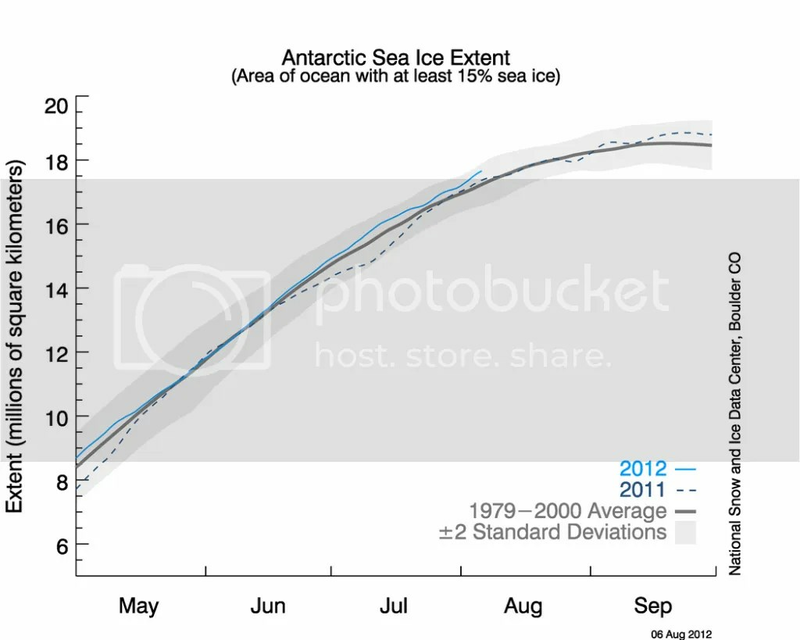 Figure 9 – NSIDC Antarctic sea ice extent time series through early August 2012. Antarctic sea ice extent had remained at or above average to some extent through the late austral fall and through the austral winter, which is good news. The difference in conditions from the first part of 2011 to the similar time period in 2012 is obvious: NSIDC measured last July’s extent near the bottom of the standard deviation envelope while this year’s extent is much healthier. Here are my State of the Poles posts from July and June. You can find NSIDC’s August report here. Categories: environment, global warming, NASA, science | Tags: arctic ice, Arctic sea ice extent, climate change, climate change effects, global sea ice, global warming, ice thickness, NSIDC | Permalink. Ernesto underwent some intensification today, reaching hurricane strength as of the most recent advisory update from the National Hurricane Center. Within the next 12 hours, Hurricane Ernesto will make initial landfall along the Mexican coast, north of Belize. He is predicted to spend just under 24 hours moving over Mexico (weakening to a Tropical Storm) before re-emerging over the warm southern Gulf of Mexico waters. Just over one day later, Ernesto will likely make second landfall along the Mexican coast (likely re-strengthening to a hurricane). 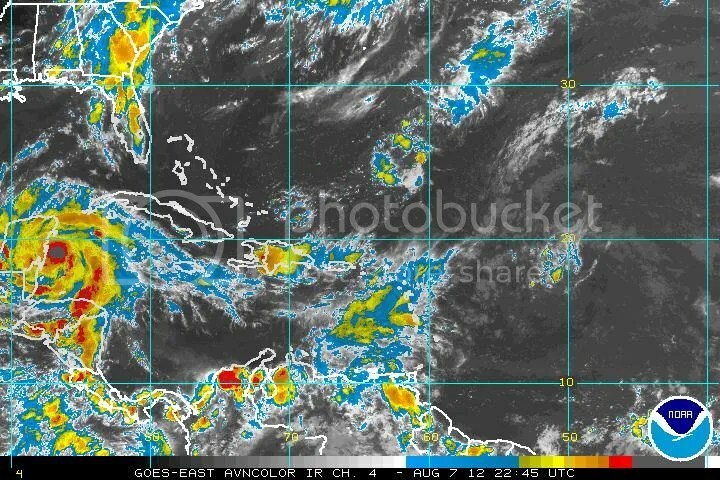 Categories: NOAA, science | Tags: 2012 Atlantic hurricane season, Hurricane Ernesto, hurricane landfall, Tropical Storm Ernesto | Permalink.